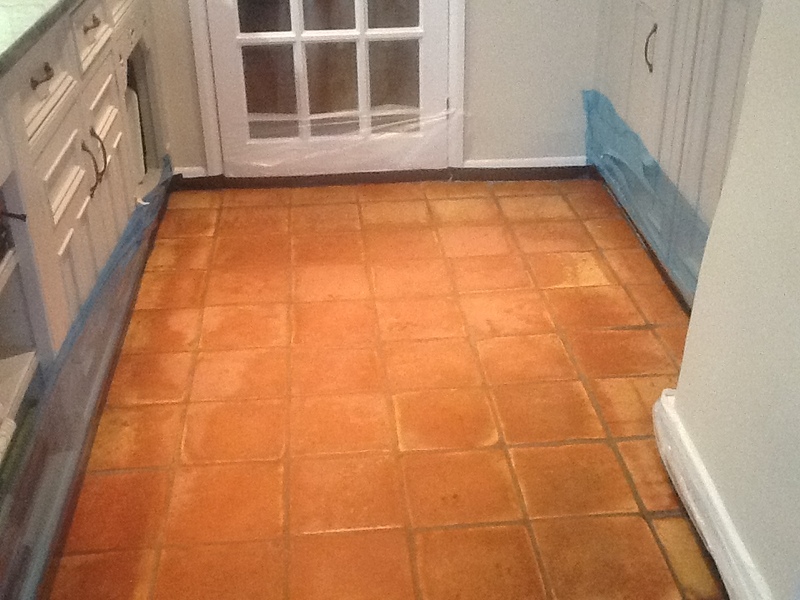 The photographs below show a Terracotta Tiled floor we maintained that was installed in the kitchen and conservatory of a house in the Northamptonshire village of Holcot. 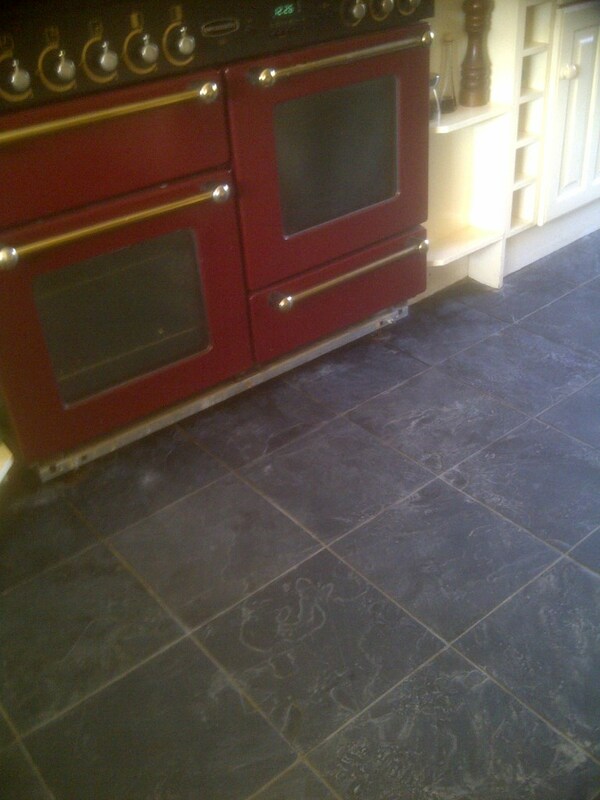 The tile and grout was in good physical condition but had become ingrained with dirt and were now in need of a deep clean and reseal. First job was to protect the kitchen units, doors and skirting boards during the cleaning process for which I used blue plastic sheeting. 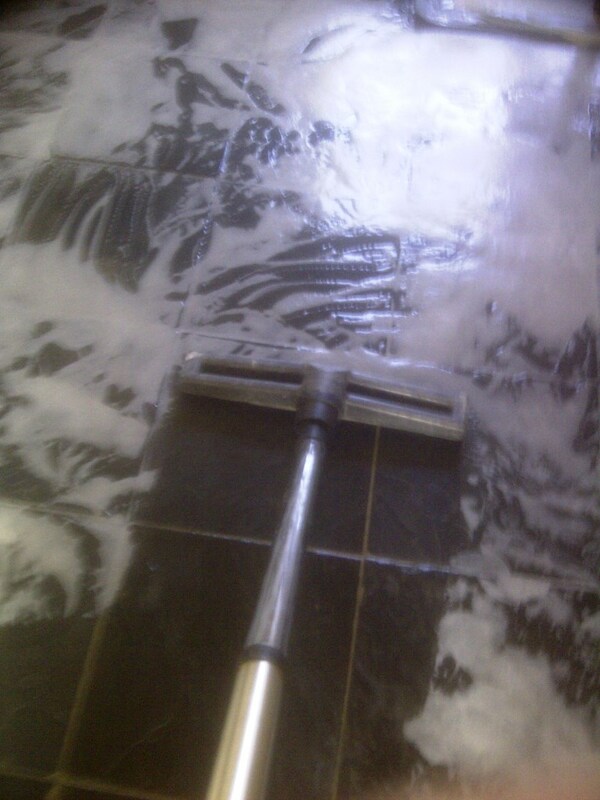 Next a strong dilution of Tile Doctor Pro-Clean which is an industrial strength alkaline cleaning product that’s safe to use on tile and stone was applied to the floor using a mop. The solution was left it to dwell on the floor for twenty minutes in order for it to soak into the tile and get to work on the dirt. 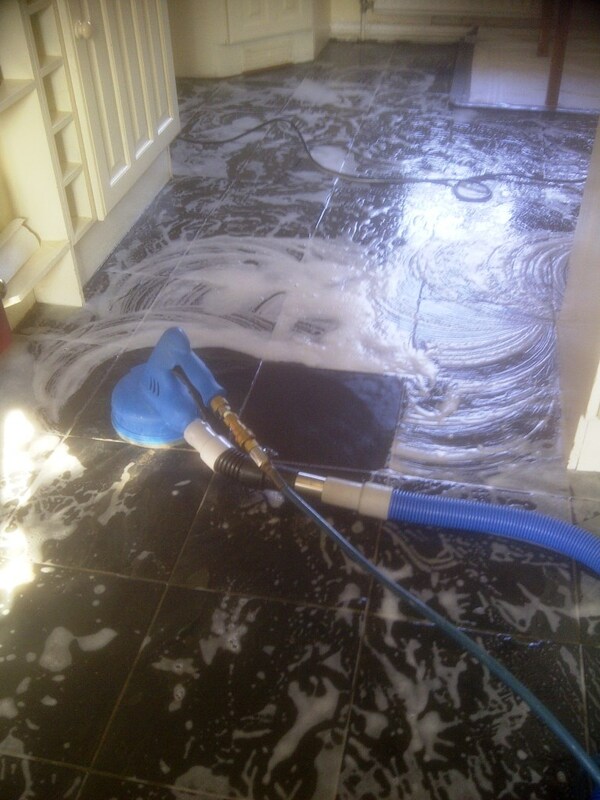 It was then worked into the floor using a rotary machine fitted with a black scrubbing pad and stiff hand brushes were along the grout lines where the pad struggled to reach. 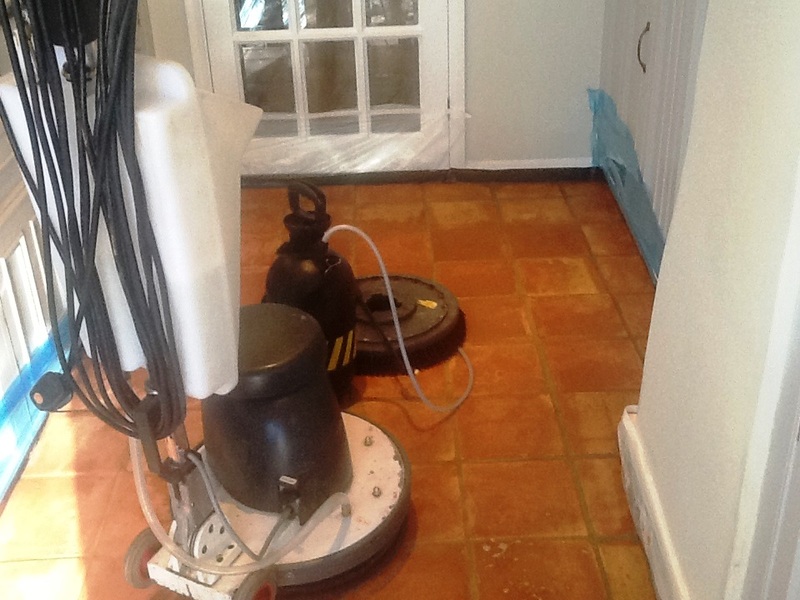 The soiled solution was picked up using our large wet and dry vacuum and the floor was then rinsed with clean water to neutralise the tile and allow us to see which areas need further attention. The process was repeated until I was happy that any old sealer and all the dirt had been removed and then the floor was given a final rinse, wet vacuum and then left to dry overnight ready for sealing the next day. 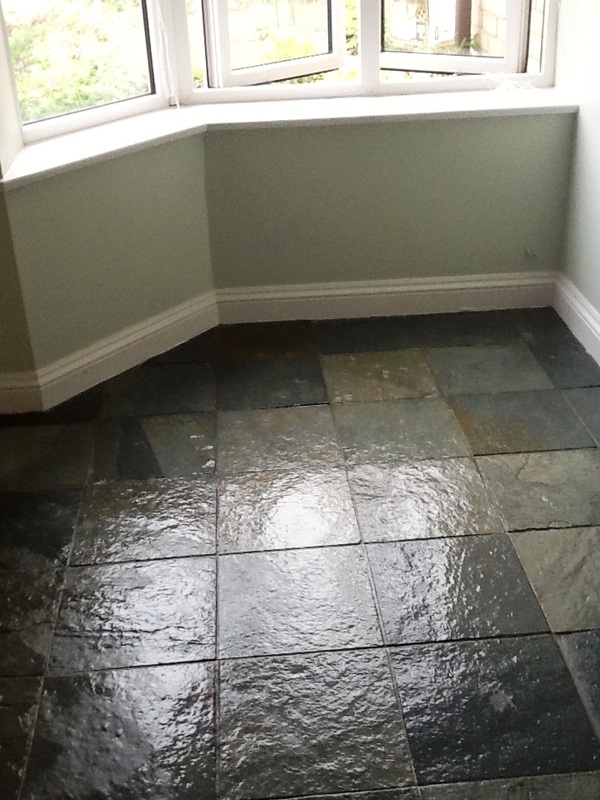 When I returned the next day I checked the floor had dried using a damp meter which it was and so proceeded to seal the Terracotta tiles with seven coats of Tile Doctor Seal and Go which will protect the tiles from staining and also add a nice subtle shine to the floor. Terracotta is a clay based product and so naturally quite porous. 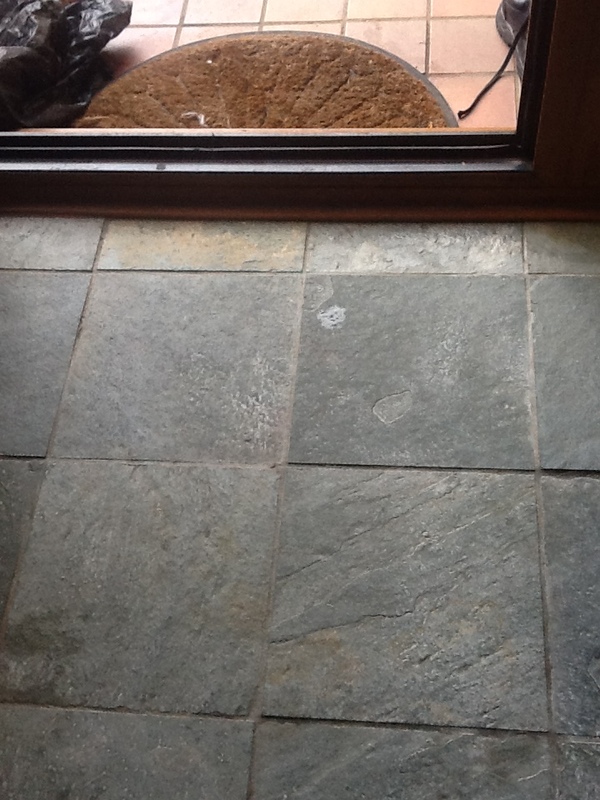 Another example of a tired Slate Tiled floor that was in need of a clean and seal, this time in the industrial town of Corby famous for its iron and steel works. 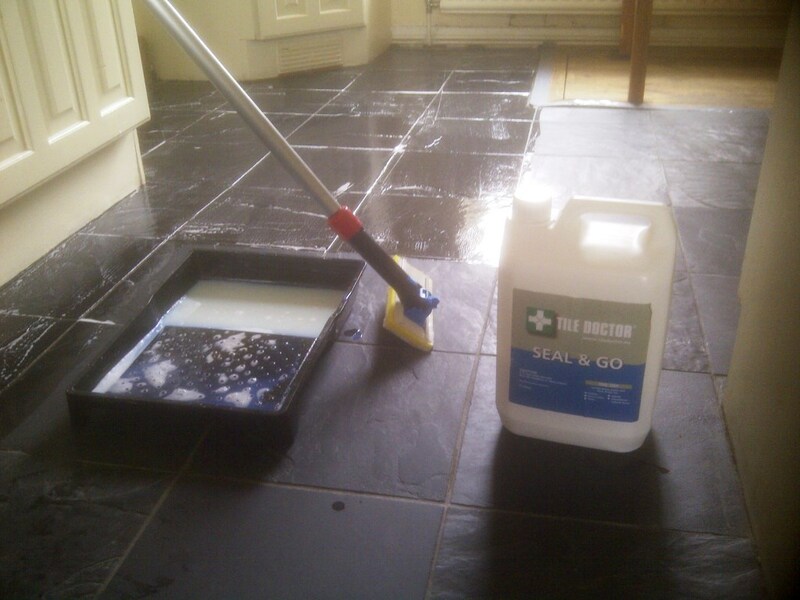 To get the Slate tile and grout clean the a dilution of Tile Doctor Pro-Clean was applied which was left to soak into the tile for ten minutes before scrubbing it in with a rotary machine fitted with a black scrubbing pad and then using a stiff grout brush to clean along the grout lines. 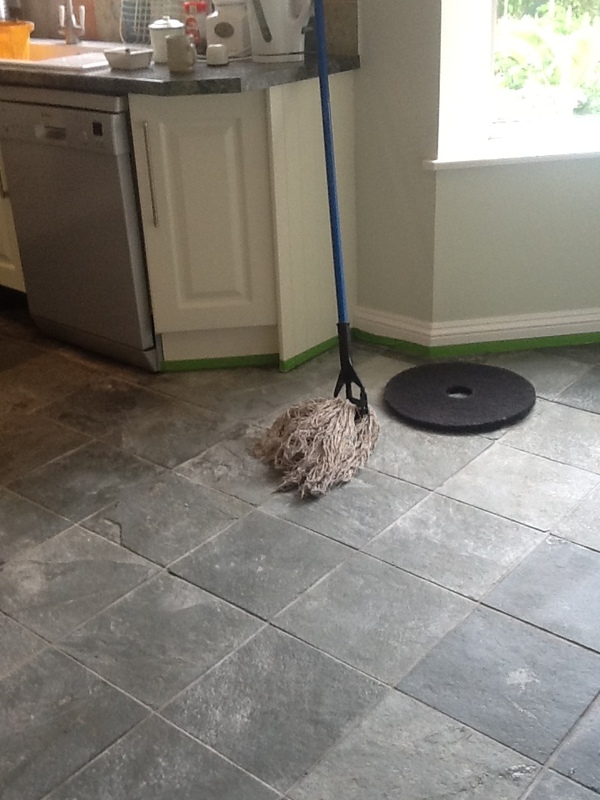 The floor was then thoroughly rinsed using clean water which was then removed using a wet vacuum; there were a few stubborn areas that needed further attention which were re-treated. 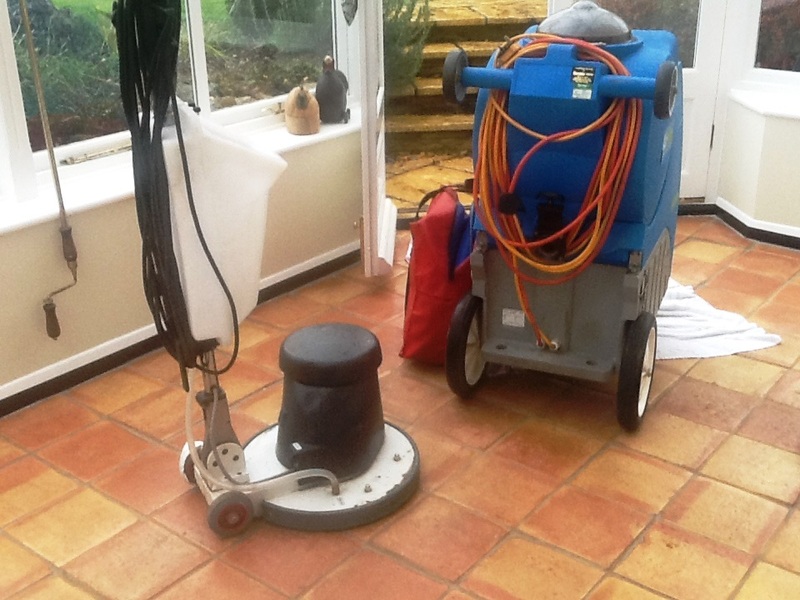 The last step of the cleaning process was to use a high pressure cleaning tool that extracts as well as washes, we normally use this tool for cleaning carpets but it also does a great job of giving a hard floor a thorough rinse to remove any trace of cleaning product before sealing. 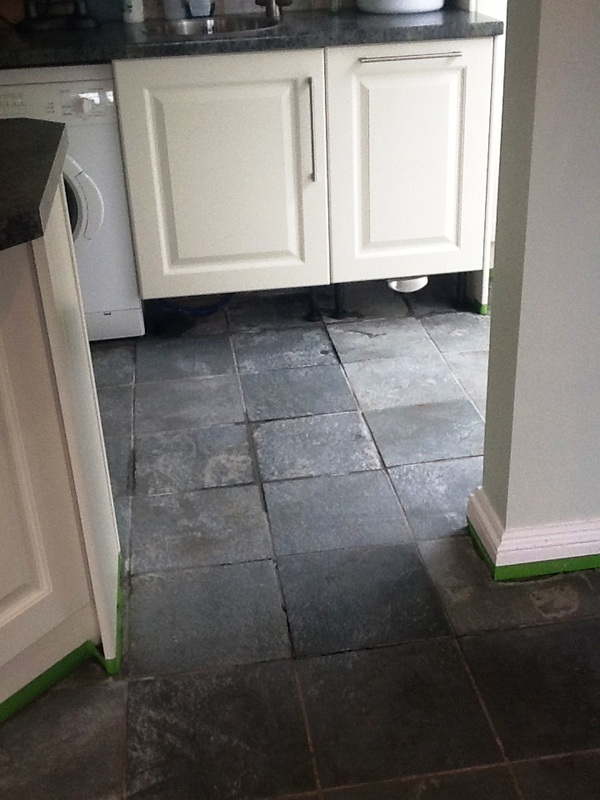 The floor was left to dry and we came back the next day to seal the slate using five coats of Tile Doctor Seal and Go applied using a paint pad applicator. 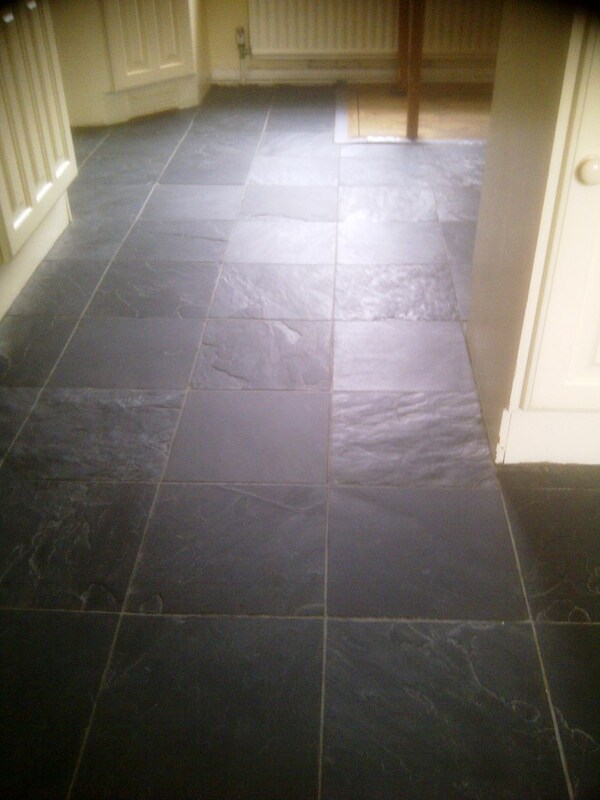 I usually use Seal and Go for slate tiles as it provides good stain protection with adds a nice sheen finish that adds to the look of the floor. 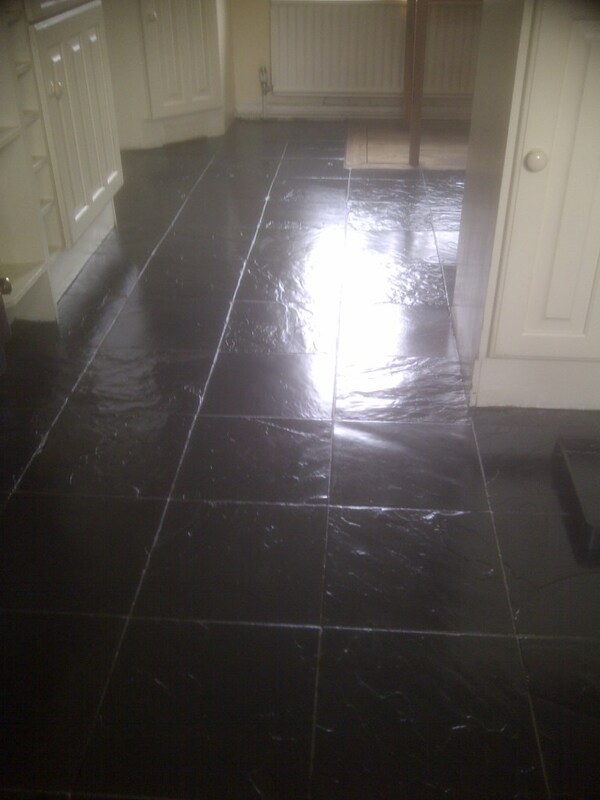 The job took two days and the floor now looks transformed. 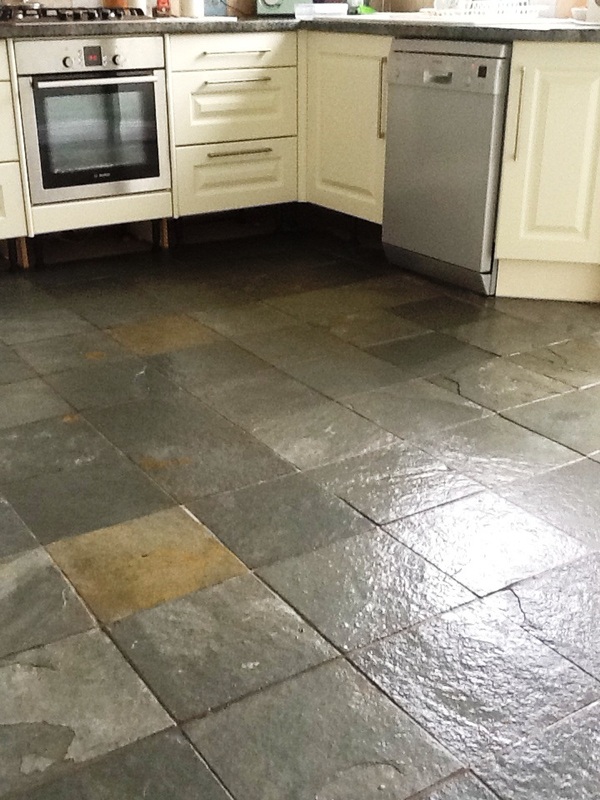 These photographs of a Slate tiled floor were taken in the Kitchen of a house in Towcester where the slate was looking rather dull and had lost its appeal. 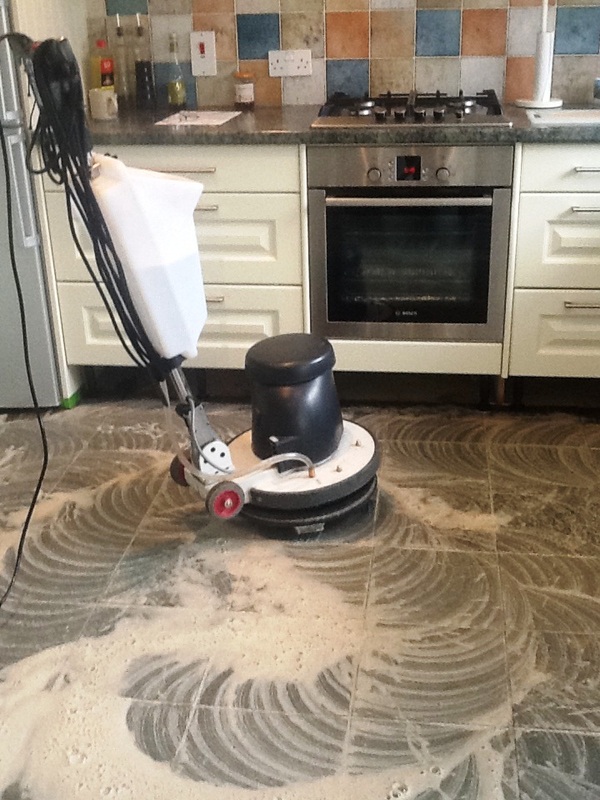 This does happen with natural stone floor where the sealer which can add a shine to the stone becomes worn down and ineffective. 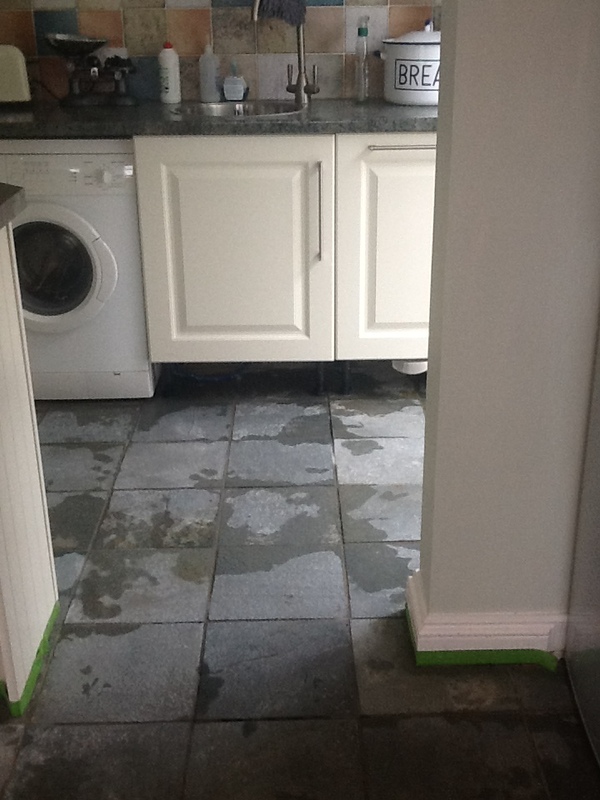 We removed the kickboards from the kitchen units and lined the skirting boards with green Frog tape in order to protect them from cleaning fluids. 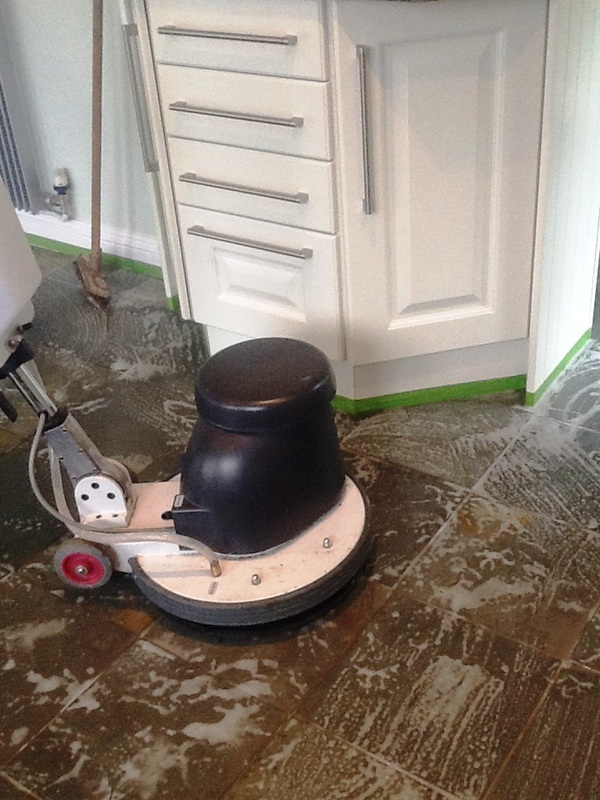 The next step was to soak the floor in a dilution of Tile Doctor Pro-Clean which we let soak into the tile for 10-15 minutes before scrubbing it in with a rotary machine fitted with a black pad and then using a stiff grout brush to clean out the grout lines. 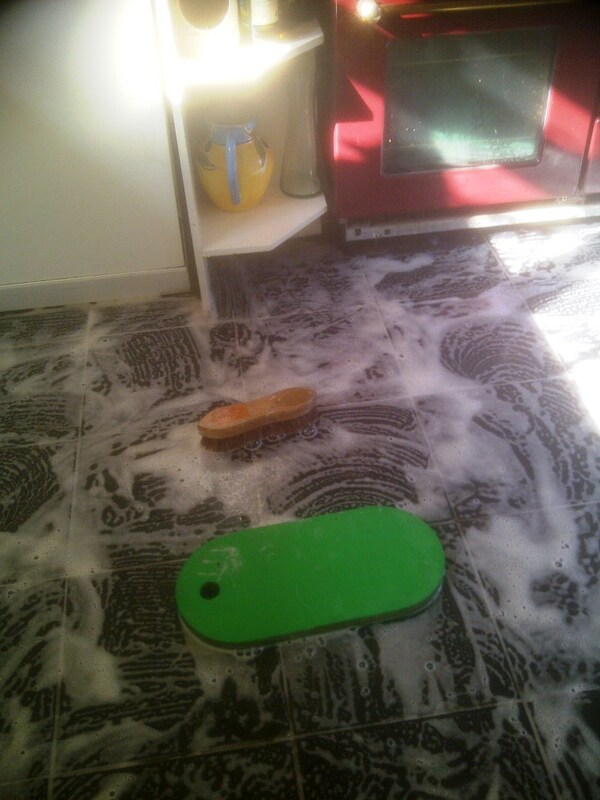 The floor was then thoroughly rinsed using clean water which was then removed using a wet vacuum. 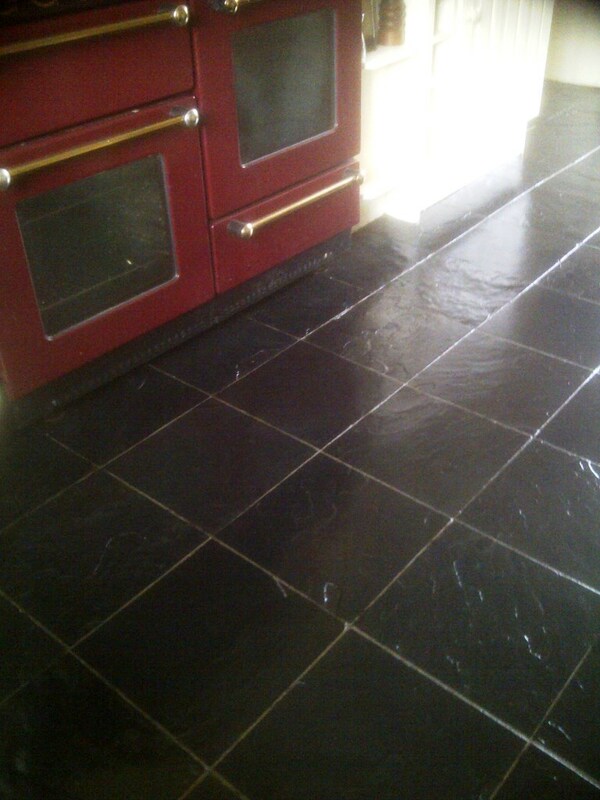 The floor was now free of sealers etc. and this showed up a few stubborn areas that needed to be retreated and washed down again. 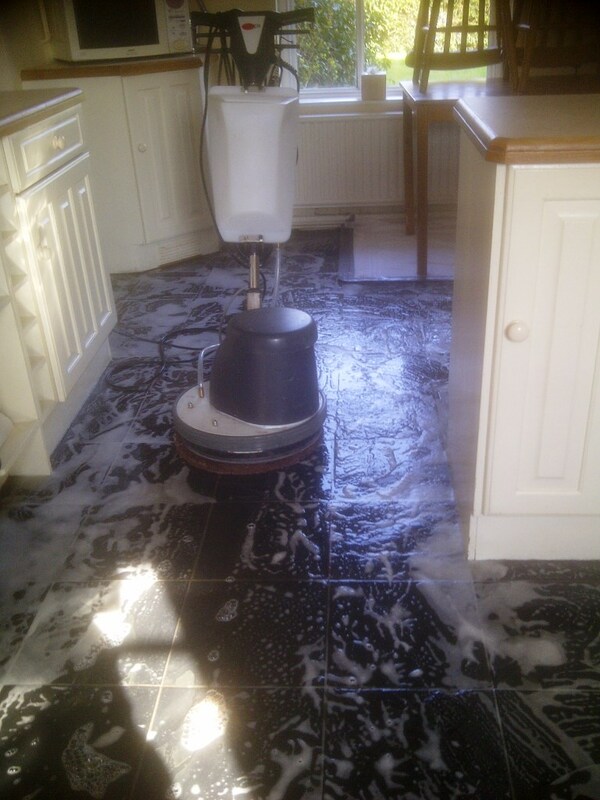 It’s important to give the floor a good rinse to ensure it’s free of any cleaning products as they can upset the sealer. The job took two days and the floor now looks much better and much easier to clean, certainly the customer was very pleased and left the following message on our feedback system. Phil is extremely professional and provided excellent customer service. He explained the process in detail and did a thorough job and worked extremely hard. The job was completed in the time proposed with a brilliant result. We have no hesitation in recommending Phil to others. Thank you.